← Should USF Funds be used for broadband in areas that already support private sector investment? 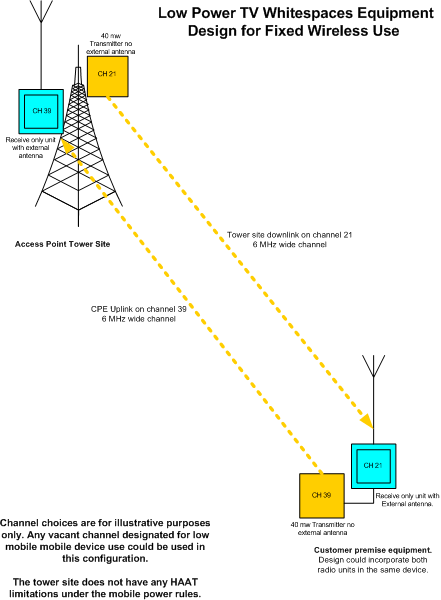 I have been reading through the new TV White Spaces rules and it occurred to me that if the wireless radio manufacturers could get away from half duplex radios running on the same frequency, fixed Wireless Internet Service Providers (WISP’s) could actually use the first adjacent TV channels for outdoor wireless broadband systems. How is this you ask? Well in the first adjacent channel you can run up to 40 mw with a 0 db non detachable antenna. 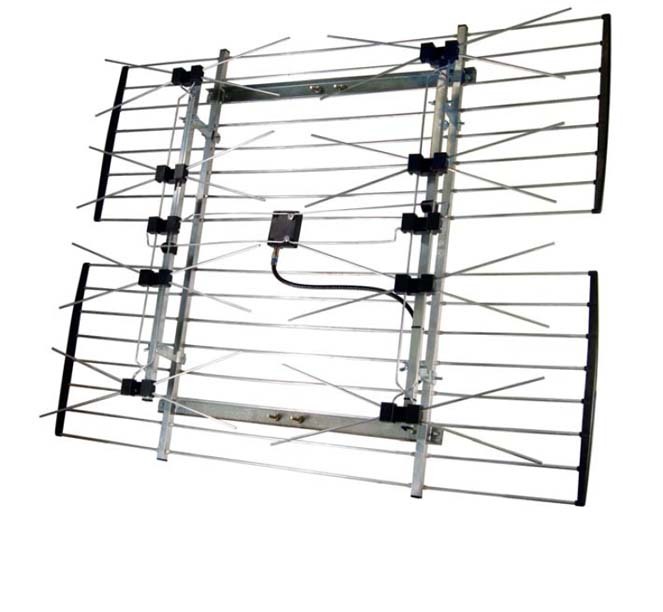 If a person were to use a separate receiver with a commonly available 15 db TV style antenna, you would be surprised how far a 40 milliwatt signal will travel on these unused TV channels. You would have a separate transmitter/receiver combination on each end of the link. Unlicensed devices can operate in the first adjacent channels under the mobile power level rules using channels 21 and up (with the usual exceptions like channel 37 and the reserved channels for wireless mics). If you do not transmit through the 15 dbi antenna there is nothing in the rules against using a high gain receive only antenna. A manufacturer could produce a radio that has a separate transmitter and receiver in the same box. One for transmit at the 40 mw level with no external antenna and another that receives only with an external antenna port. On this port you could attach a common bow tie TV antenna that has up to 15 dBi gain. Kind of like a full duplex radio. This would create a balanced path plus it would have the effect of 12 MHz bandwidth because you could use separate transmit and receive frequencies. It would also make it easier to deal with the problem of non adjacent channel availability in any given market. For example you could transmit on channel 21 and set the receiver to listen on channel 39. Low Power TV Whitespaces equipment design for fixed wireless use. One of the big advantages to TVWS spectrum is ability of these signals to travel farther through space than a Wi-Fi signal can. The lower free space loss and attenuation through trees creates a perceived gain between 15 and 20 db compared to the unlicensed 2.4 and 5.7 GHz bands! Add a 15 dBi gain antenna and you can see where a 40 mw signal can propagate just as far as fixed wireless internet systems in use today on the higher frequencies. Bowtie UHF TV antenna that could be used for TVWS receivers. This type covers all the UHF channels allowed for mobile TVWS equipment. There are other advantages to a split transmit receive architecture. Since it would be able to legally operate in the more populated metro service areas, there is a much larger potential market. This would give manufacturers more opportunities to sell radios creating a larger economy of scale. With the flexibility of choosing various TV channels for either uplink or downlink there would be much less of a requirement to stock specialized radio systems for various channels. The flexibility in channel selection will also give network operators more options to work around other users and interference sources. Using broadband TV antennas would require the manufactures to adapt the antenna port to 75 Ohms but that is a minor change. TV antennas would be something consumers are more accustomed to seeing and they would also fall under the OTARD rules for zoning exemptions. Radios operating at the mobile power levels are also exempt from the height above average terrain (HAAT) rules. For those operators who were concerned about this limitation under fixed wireless systems rules, this is one way to make use of TVWS spectrum. Using this type of configuration, radio signals can easily travel 2 to 4 miles with the 40 mw power levels. In areas where non first adjacent channels are available for use, the power levels can be set to 100 mw. These are but a few of the options that could be employed. The key point to understand is that the mold needs to be broken as to what types of radio configurations should be put to market. Half duplex single channel radios will stifle the opportunities to maximize the use of this great spectrum. We have a clean slate where we don’t have to fit in with other consumer electronics devices. This band was specifically set aside for wireless broadband systems. Employing the most spectrum efficient equipment arrangements will leave the maximum number of opportunities for the greatest number of uses in these bands. The effects of repacking the TV bands remains to be seen but it stands to reason that the equipment with the most flexible configurations will continue to allow viable unlicensed use of the band. This entry was posted in Broadband Internet, Broadband Stimulus, High Speed Internet, Internet Adoption Rates, Mesh Network, Muni Wi-Fi, Municipal Wi-Fi, Telecommunications. Bookmark the permalink. 1 Response to TV White Spaces can be used for fixed wireless in large metro markets…but only if the manufacturers change equipment design convention.